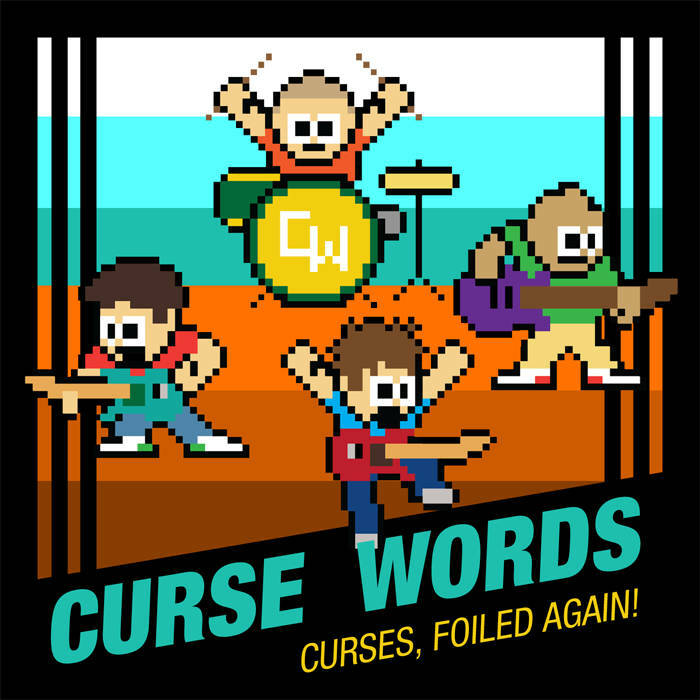 CURSE WORDS: Curses, Foiled Again! This is one of my favorite genres of music, and I had a really good time listening to this album. Just the right amount of catchy, poppy, heavy, and altogether unique. Apparently The World is Ending is a great opener. Full of beautiful vocal harmonies that can only be expressed in a certain kind of rock/punk/just all around badass music. The versatility is there, and the song has a really nice drop off into a slower riff. “In the dark dark night, I’m screaming, let there be light.” This really is just begging for a crowd of a thousand people singing along. I’m a huge fan of the lyrics in this song, and this album in general. Good writing starts with the melodies, but good lyrics make into something timeless. Fault Line has some great drumming and octave chords to start it out and set the pace. Honestly it reminds me a lot of early Rise Against, something that really is not easy to pull off. It’s great to hear an album where every member of the band is very talented. The held out chords with the lead played over is just such a classic sound. It’s almost impossible to not at least nod your head along with the melodies. Fault Line has a very pleasant sound, with quick changes and tight rhythms. The drummer really shows his chops here, I’m always impressed with the dexterity of drummers in bands like this. Listen to this song in particular and keep and ear out for the subtleties of the drumming. The Worry and The Wait, this is my favorite song on the album. The echo of the ride, the guitars playing over each other, and the clear ring of the vocals underlined by a thumping bass. The vocal harmonies are great, I’m a huge fan of original voices singing over each other. This is the kind of song that will come in and out of your head for the rest of your life. The song itself has a great message, if it could be called a message. It’s more of an experience, a feeling of unease that can be felt in the pit of your chest when hard times hit. It ends with some very skilled soloing. Excellent song all around. Game Over, Insert Coin picks up to that essential core of punk drumming with the old school beats straight out of 1983. This style of drumming takes a lot of talent, and time to perfect. If I was the drummer in this band, I would be very proud of this. That might be a little biased since I can barely hold two drumsticks in my hands without falling into the kick drum, but on every song I find myself focusing on it. Talented people can always grab your attention. Not to say that the other members aren’t equally as talented. “This is how it falls apart.” The lyrical content of this song hits close to home for me. People try to plan things in life, organize how the future will turn and the people we will spend that with. Even plans that seem infallible, the future that you imagine won’t always be the future that unfolds. The closer, Chippaway, opens with some very catchy guitar harmonies. Separating the verses, with the bass guitar carrying them, it’s a really nice sound. The lyrics in this song are the ones I identified with the most, for sure. The theme of the world chipping away at you, putting cracks in your foundation is something that I’ve really felt in life. The way that thoughts can be expressed in music, to me, is a better way of speaking about how you really feel, and the way life can struggle. It’s a strong closer to a strong album, and I can’t wait for my chance to see them live.